How can I support Como Park Zoo and Conservatory? There are many ways to support Como Park Zoo and Conservatory. Visitors can donate, become a member or sponsor a garden or animal through Como Friends, the nonprofit partner of Como Park Zoo and Conservatory. They can be reached at 651-487-8229 or by visiting www.comofriends.org. Como Zoo and Marjorie McNeely Conservatory are open every day of the year. During inclement weather, some animals may be off display and some exhibits or gardens may be closed. I’m coming with a group. What should I know? We strongly encourage all groups (schools, seniors, businesses, etc.) that are coming to the Zoo and Conservatory to call ahead of time to let us know the date, arrival time and size of your group. This information will help us when scheduling staff and volunteers for those busy visitor days throughout the year. Please complete the School and Group Visit Notification Form to let us know about your upcoming group visit. Group Lockers: Group lockers are located on the second level of the Visitor Center. Each locker provides space for approximately 50 lunches and 50 coats. Reserve a locker at the Visitor Services desk the day of your visit. 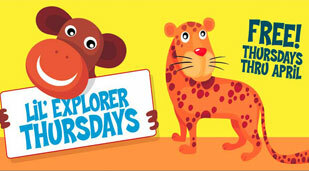 Como Zoo and Marjorie McNeely Conservatory are free, but we do need help from our visitors. We ask that our visitors consider making a voluntary donation of $3 for an adult and $2 for a child to help us care for our plants and animals. We appreciate your support and want you to know that everyone is always welcome whether or not you choose to make a donation. Parking is free. It's okay to take pictures, but tripods are not allowed in the Marjorie McNeely Conservatory. All photographers (professional or amateur) who conduct posed photography are required to review our policy for Posed and Commercial Photography and obtain a Photography Permit. The Photo Policy has been established to allow free-flowing foot traffic and provide an enjoyable experience for all our guests. We invite you to take photos and videos at many of the other beautiful locations on the Como Campus where a permit is not required. For questions or for the full policy, please visit Visitor Services. Definition of Posed Photography: Como Park Zoo & Conservatory defines posed photography as any photographer (amateur or professional) that gathers a group together for a photo and/or poses individuals for wedding, prom, family, or engagement photos. Definition of Commercial Photography: We define commercial photography as professional, wholesale, and retail uses of photography for advertisement. All commercial photography requires a reservation for before or after public hours. Can I reserve a picnic space? Picnic tables are available first come - first serve for the general public in Como Park located across Midway Parkway near the Palm Lot parking lot and Como Town Amusements. Click here for more information on the Como Park picnic area. Any grassy area in public spaces is also available for picnic-style lunches. Detailed driving directions to Como Park Zoo and Conservatory. Click here for a map of the Como Park Zoo and Conservatory grounds and for the location of our parking lots. Como Park Zoo and Conservatory offers a free shuttle ride at an off-site parking lot on Como Avenue. To get to us by bus, contact Metro Transit at 612-373-3333 or visit www.metrotransit.org for current bus routes and schedules. Pets are not allowed on Zoo and Conservatory grounds. Service animals are permitted, but may cause undue stress on zoo animals. In this case, the owner may be requested to remove their service animal from a particular building, exhibit or the zoo grounds. Strollers and wheelchairs are available for rent at Garden Safari Gifts. Single-seat strollers and wheelchairs are available for $5 per day. Double-seat strollers are available for $8 per day. Some type of collateral, such as a driver license, is required and will be held at Garden Safari Gifts during the rental period. All rentals must be returned to Garden Safari Gifts before the Zoo and Conservatory close. How do I request a donation from the Zoo? Como Friends and Como Park Zoo and Conservatory receive many more requests for donations than can be accommodated. We do try to fulfill, on a monthly basis, as many that fit the criteria below (up to 10 per month). 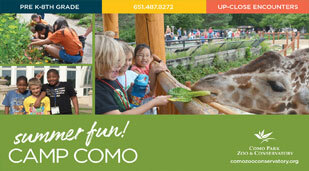 Como Friends and the Zoo & Conservatory work with many partner non-profits. If your organization has a relationship with Como, your request will receive a higher priority. Como values our 1,200 volunteers. If a volunteer of Como Friends or the Zoo & Conservatory is involved in your organization, your request will receive a higher priority. Send the following information to the address below or email to comomembership@comofriends.org. Please forward this error screen to s91085.gridserver.com's WebMaster.